Jimmy Cliff had Many Rivers to Cross, The Melodians and Boney M sustained their spirituality By the Rivers of Babylon, and Morgan Heritage sought refuge Down By the River. Pursuing this theme then - a popular one in Reggae music - it can be exclaimed that no person steps in the same river twice. Think Africa’s historic River Nile or Brazil’s majestic Amazon. Put another way: nothing stays the same; but the river remains a river. And as these powerful waterways have many tributaries and offshoots so it is with the main source of Reggae music. Emerging from an African centred Jamaican folk and people’s culture and inspired as it was - and is - by Rastafari the genre was birthed during a phase of Jamaican and world history witness to the global anti-colonial and anti-imperialist struggle for independence. That this influential and internationally popular genre was born at that time and place mean the cultural manifestation in social form that is Reggae music has developed with a definite essence; but also evolved in myriad ways over its 50 year lifespan. And its genealogy and ancestors are equally important to its modern character and identity. So when a Chronixx, Proteje, Etana or Morgan Heritage emerge from the pack with the imprint or DNA of say, a Marley, a Burning Spear, a Culture or a Horace Andy it is clear that Reggae music is healthy still. These are the sentiments which will draw people to the day-long festival RiddimUpLive: A Reggae Cultural Exchange which sees one of the current champions of conscious Reggae - Dre Island from Kingston, Jamaica - making his British debut. Promoters Riddim Radio and BANG Radio have assembled musicians, artists and experts to celebrate the deep roots of the music and the art, culture and soul at the centre of its revival. 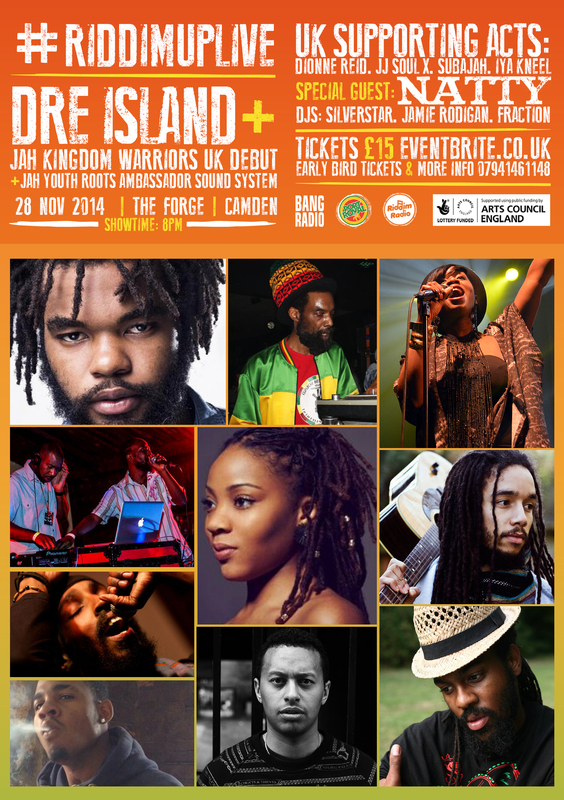 Local artists joining Dre Island for the evening performances are from the new wave of rootsy Reggae - Jah Kingdom Warriors Band, JJ Sou Soul X, Dionne Reid, Subajah, Iya Kneel and special guest Natty. The daytime reasoning symposium - grounation style - to explore cohesive messages, shared cultural pillars and the challenges and impact of Reggae and Rasta culture will encourage overstanding through debate and discussion. And Caribbean food and stalls will offer networking opportunities in surroundings where exhibits from Matthew McCarthy’s New Jamaica Movement - currently revolutionising the JamRock street art scene - will be on display. Jah Youths Roots Ambassador Sound play the music alongside DJs Silverstar, Jamie Rodigan and Fraction. £15 gets a day-pass ticket which includes the 8pm live event; or £5 at the door for the Symposium alone. Wade right in. Be a part of the Reggae Revolution. Follow @RiddimUpLive on Twitter and Instagram.